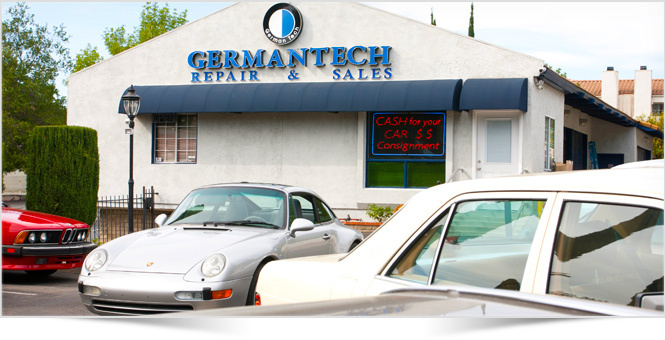 Why should you choose German Tech Auto Repair as your automotive service center? What makes us different from the other shops in town? We have been in business since 1991 and serving the Conejo Valley for nearly 20 years, establishing a reputation for honest, reliable service. This is not only the community where we work, but it is also our home, so keeping our neighbors happy is very important to us. The ability to properly service European motor vehicles requires technicians with specialized knowledge and training, as well as specific tools and software. By exclusively servicing only European vehicles, we are better suited to service these cars compared to other independent automotive repair shops that work on a variety of brands. Our technicians have approximately 90 years of combined experience, both European and American trained. In addition, we use the latest diagnostic computer software and use only high quality parts. Can you wait while we service your car? Of course! We have a quiet and clean waiting room available, with coffee, tea, water, snacks and free high-speed Internet. Directly across the street is the Lakes Shopping Center, where you can go for a fresh squeezed juice, lunch, day spa treatments, or shopping. There is a playground for young children, and during the holidays, there is even an outdoor skating rink. Oil changes take approximately 1 hour to 1.5 hours depending on the vehicle. Diagnostics, full maintenance and repairs typically take a full day if we receive the car early enough. Rarely do cars require multiple days unless the repairs are extensive, body work is needed (i.e. paint must dry), or the parts are not readily available. Does German Tech offer loaner or rental cars? We have relationships with rental car locations, and will be happy to help arrange a pick up for you at our price. Does German Tech have a courtesy shuttle? Yes, we can make arrangements for local rides in the Westlake Village/Thousand Oaks area. Please let us know when making an appointment if this is something that you will need. What warranty does German Tech offer on parts and services? We offer a 24 month /12,000 mile warranty on labor and parts installed and provided by us. Some wear items may be excluded. Can you bring your car to an independent repair shop while it is still under factory warranty? Yes, you can have an independent service repair shop work on your vehicle while it is under factory warranty. Federal law allows you to have your car serviced at the service provider of your choice. If you drive a leased vehicle, are you still responsible for the maintenance and repairs? Can you service your leased car at German Tech? Yes, if you leased your vehicle, you are responsible for all maintenance and repairs, and you can have those repairs done at the service provider of your choice. What parts does German Tech use? We only use OEM (Original Equipment Manufacture) parts or the equivalent. Does German Tech perform inspections on used cars? Yes, we do used car inspections, and we encourage this for every customer looking at a used car. Does German Tech work with insurance companies? Do you have to use a direct repair shop for bodywork? Yes, we work with all insurance companies. You do not have to use a direct repair shop. State law gives you the right to use the body shop of your choice, even if your insurance company tells you otherwise (eg. California Insurance Code §758.5). We recommend that you have your oil service with synthetic oil done every 6,000 miles. If you let the oil break down, it becomes very thick and can lead to issues with your engine and performance of the vehicle. How do you drop off your car for service? Our regular hours are 8:00am-5:00pm, Monday through Friday. Should you need to drop your car off before or after hours, you are welcome to use our secure key drop slot to the left of the front gate. Just please remember to let us know that your car is there. We are closed on the weekend because we believe it is important for our employees to spend time with their families; however, we can make arrangements for you to drop off your car on Saturday or Sunday. Please let us know if you need us to make such arrangements.